My 11-year-old son and I have been taking some online guitar lessons, taught by Krisz Simonfalvi at Guitar 360 Method. Krisz Simonfalvi is a guitar teacher in real life and has many years of experience guiding students through the process of learning to play the guitar. Before the review, I have an online guitar lessons Coupon Code Alert! We got a Homeschool Coupon Code for Guitar360Method.com. The regular price is $149, which includes the 3-week Beginners’ Course, Semester 1 (13 weeks long), and the 2 Bonus Song mini-courses. With the Coupon Code, it’s $119.20 for 10+ hours of video content. It’s a purchase, not a subscription, so once you buy it you can use it when you need it. This is the only online guitar lessons where we’ve been able to make progress, so I think these are a great homeschool guitar lesson choice. 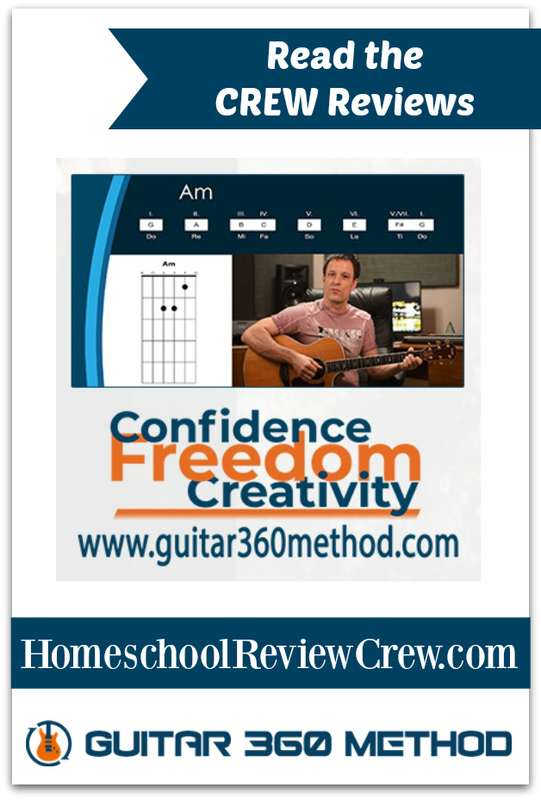 The Coupon Code for Guitar360Method.com is HOMESCHOOL20. Can We Learn Guitar Through Online Lesson Videos? Can Krisz Simonfalvi at Guitar 360 Method teach two total complete beginners, one totally old and one a bit too young? Beginners? Yeah, that’s us. We were totally clueless. Not only that, we miserably failed at guitar and gave up a couple of years ago. My son has had two false-starts at learning guitar without actual in-person lessons. My husband plays piano and was able to teach himself guitar years ago using mostly free online guitar lessons. My son wanted to learn at age 6 so we bought him a guitar. He couldn’t do a thing and grew out of that guitar. Then, my son and I tried a couple of years ago. I thought if I learned with him it would make things easier for him (and less boring for me), but we were so lost that we gave up and decided to wait a few years until he was older. Trying this out in a more serious way is my 11-year-old son (a righty), and me (a lefty) with him for encouragement. Casually trying this out (because they follow me around the house, you know) were my 8-year-old and 6-year-old. Which leads me to the recommended ages for this program. What’s the Best Age to Learn Guitar? I think that age 12+ is best for Guitar 360 Method lessons, but with guidance and enthusiasm younger kids could do it. Try the free Guitar Course For Beginners and see how it goes. Some kids start guitar really young. Going by what I’ve read and also our experiences, I’d say the teen years are probably the time period with the most chance of success. I’m far from an expert in this field, so I’ll just share our experience. #1, I am totally old with zero musical training but I was able to follow along. My 11-year-old needed a bit of guidance from me in real life a few times when he got frustrated with a buzzy string or with not feeling like he could reach the strings the way Krisz Simonfalvi was doing it. Learning guitar involves a lot more frustration up front than piano. My middle child, age 8, is a natural piano player. I mean, this child basically taught herself to read music, and she plays on our piano like some kids play video games. She teaches herself new songs and patiently works them out. I wondered what she would think of guitar. Making a pretty note on the piano is easy, but it’s not quite as easy on the guitar. She picked up the old 1/2 size guitar and lasted about two minutes. My 8-year-old was easily frustrated by her buzzy-sounding guitar strings and by the feel of the hard guitar strings. Which leads me to the fact that learning guitar hurts. We have finger dents. We trimmed our nails short and praised each other for our finger dents. They’re badges of honor, right? It means we were working. It’s just a bit of discomfort, but if your kid is not ready to put up with the feeling of this, they’re not ready for guitar. My middle child might be great at learning guitar later. My husband (with a piano background) was able to teach himself pretty well as an adult. My 11-year-old was good with a bit of guidance. I, as a total newbie, followed along just fine! To my shock! We haven’t gotten all that far yet. We have a semester of lessons but realistically I think we’re moving at half that speed, plus we had to start with the free Guitar Course For Beginners because we are such newbies. Here’s one more bonus experience: My 6-year-old is a little tornado-child, but she wants to do everything I do. As soon as my 8-year-old put down the 1/2 size guitar, my 6-year-old snatched it up and sat down with it and followed along. She’s way too young and inattentive to do much with the online video lessons, but she copied me. I can see that she can do it but she’s about twice as slow as we are…and we are already slow. You’re going to have a hard time following Guitar 360 Method guitar lessons if you don’t have a guitar. My 11-year-old has a 3/4 size guitar. He’s probably big enough to play a full sized guitar at this point, but we had bought him the guitar about two years ago when he first said he wanted to learn. I think that it’s important to have an appropriately sized guitar. A big part of the reason why I never learned guitar before is that I’m left-handed and I just.can’t.play. on a right-handed guitar. Righties always lecture me that it’s “easier” for a left to play on a righty guitar because all the complicated moves are made with the hand on the frets. If it were REALLY easier to use your dominant hand on the frets, then GUITARS WOULD BE MADE THE OTHER WAY. They are like that because it’s easier for righties. It’s not like some lefty invented guitar and made all the righties do it their way. No. Guitars are designed for right-handed people. Lefties could be at a huge disadvantage unless we get a left-handed guitar. So I finally found a left-handed guitar a couple of years ago when my son wanted to learn, figuring it would be easier for us to learn together since I have to sit through lessons with him anyway. Do you know how hard it was to find a place that would even deign to sell me a left-handed guitar? I finally bought my left-handed guitar from a store with a left-handed guitar-playing employee. They only had one acoustic left-handed guitar, but one was all I needed. My youngest child, age 6, sat around with a 1/2 size guitar. She’s left-handed and that guitar is right-handed. I wonder if we’d have to restring it, but she says it feels great playing on a right-handed guitar. As a lefty I don’t have a problem following the online videos because I just mirror Krisz Simonfalvi’s movements. When the diagrams of the chords pop up I have to remember to mirror them. I know that at least a couple of times I did it backwards! I knew I wasn’t getting the same sound but wasn’t sure what I was doing. I realized it when I looked at my son’s hands and saw that I wasn’t mirroring them. One of us was wrong, and it wasn’t me. So, in this instance, I needed my 11-year-old to help me! Simplicity. I log in and I see my purchased course, and it’s just simple and it’s there. I’ve got the free Guitar Course For Beginners, Bonus songs, and Semester 1. It’s really easy to figure out what we’re supposed to do next. So far we haven’t gotten off-course at all. When we tried other stuff there were choices for pathways, and the choices we made ended up just being frustrating for us. We just need someone to teach us what to do. When we were trying to choose for ourselves it was a disaster and we quit. Realistic. There are a bunch of guitar scales in the Free Guitar Course For Beginners. We did a lot of them but didn’t master them, and skipped through to see the next video. And there was Krisz Simonfalvi telling us that he knew we probably skipped over a lot of scales. Hah! The lessons are realistic that new students don’t want to put up with a lot of repetition and boredom. It’s there and it’s easy enough to follow along, and definitely I think that I progressed better than my son did because I was willing to sit through and do the scales for longer and more often. But you aren’t stuck on them if you’re really curious or motivated to try something else. Purchase, not Subscription. I know everyone is looking for free online guitar lessons, but realistically you are not getting very far with the free stuff. You’re going to get what you pay for to a certain extent. But for students like my son and I, a subscription is not reasonable for us. We’re just too slow at this. I hate feeling like I have to hurry through lessons because a subscription is going to run out. I want to buy access to the lessons and then be able to go through them at our pace. Guitar360method.com is a purchase, so we’ll have access to Semester 1 for longer than just one semester. Like I said, I think our pace is a lot slower than others and we’ll need a year to get through these lessons. But so far, we’re getting through them. For homeschool families with lots of kids, and young kids, I think most of us strongly prefer to purchase rather than be stuck with a subscription. Purchase vs. Membership is a really strong motivator for us to continue with Guitar360Method.com. Method. I don’t understand much about guitar teaching methods, and the beginning lessons of all the courses I’ve seen seem to be pretty similar. 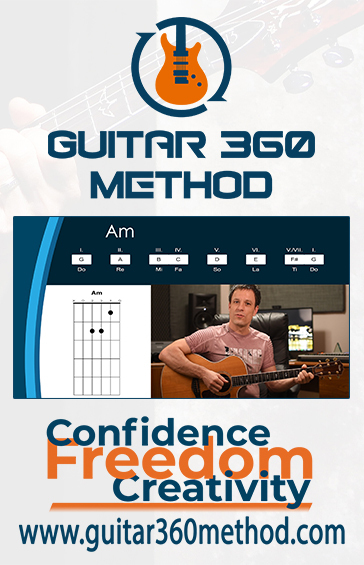 Guitar360Method teaches musical theory and an understanding of the guitar as an instrument. It is designed for students who want to be creative on the guitar and understand how music works, rather than JUST learning songs. That’s how my middle child has learned piano best, so I really love this about Guitar 360 Method.